Mercedes has announced a new C-Class car with its next-generation four-cylinder diesel mill, uniquely titled "BlueEFFICIENCY." While we're not sure about the name, the specs are certainly impressive: Mercedes claims 204 HP and 369 lb-ft of torque from the 2.2-liter four, while returning a combined 45 MPG and meeting EU5 emissions standards in C-Class Prime form. Mercedes claims the BlueEFFICIENCY engine will replace four separate diesels at the company, and be offered in the E-Class, the new GLK-Class and in a future E‑Class Coupe in addition to the C-Class. More info and full release after the jump. So what does the C250 Prime Edition get you? In addition to the fancy oilburner, the Prime also has low rolling-resistance tires, some aero tweaks to the exterior, a 6-speed manual gearbox, special power steering that saps less energy and an efficiency monitor that provides feedback to the driver (read: shift light). One of the 5,000 C250 CDI BlueEFFICIENCY Prime Editions will run you the equivalent of about $58,000; no word on US availability. C 250 CDI BlueEFFICIENCY Prime Edition: Efficiency and driving pleasure on a new plane Mercedes-Benz is set to launch a completely new diesel engine generation starting in the autumn of 2008. For its world premiere, the Stuttgart-based car manufacturer will unveil a C-Class model with this new four-cylinder engine. In the C 250 CDI BlueEFFICIENCY Prime Edition, this engine produces, with its 2.2 litres of displacement, 150 kW / 204 hp and 500 Nm of torque. The premiere model can accelerate from a standstill to 100 km/h in just 7.0 seconds, on the way to its top speed of 250 km/h. Notwithstanding these exceptional performance figures, the Prime Edition only consumes an average of 5.2 litres of fuel per 100 km (NEDC), with CO2 emissions of 138 g/km. The engine impresses with its eager responsiveness and smoothness of operation, which can make it a sensible alternative to the higher-displacement six-cylinder engines in future. The Mercedes-Benz C-Class is a great favourite with the public. Since its official market launch on March 31 2007, over 400,000 buyers have opted for a saloon or an estate from this model series. As a result of this, the C-Class has maintained its position as world-wide market leader in its segment. The new C 250 CDI BlueEFFICIENCY Prime Edition adds a further highlight to this successful model series which has already received numerous distinctions. With the new diesel engine, which celebrates its world premiere in this model, Mercedes-Benz shows that frugal consumption and high output - and with them both environmentally-friendly driving and driving pleasure - can be mutually compatible. Exemplary figures in terms of power output, consumption and emission characteristics A displacement of 2143 cc, 150 kW / 204 hp, and 500 Nm of torque - these are the engine's key figures. Figures that place this newly-developed four-cylinder diesel engine in the top position among the diesel engines of its class. At the same time, in the C 250 CDIBlueEFFICIENCY Prime Edition, the engine consumes on average just 5.2 litres of fuel per hundred kilometres (NEDC), a value achieved by no other comparable motor car. Apart from exceptional power output figures, the new powerplant offers significantly improved torque build-up from low engine speeds, compared to its predecessor model. The benefit of this is that in everyday driving situations it enables low-consumption driving at low engine speeds. In addition, the new engine will assume market leadership in terms of untreated exhaust emissions. Already today, it complies with the future EU5 emissions standards and, beyond that, has the potential to comply with the EU6 and BIN5 standards as well. Exemplary figures in terms of power output, consumption and emission characteristics are achieved by the new engine thanks to the implementation of a whole package of innovative technologies. This includes among other things: * a maximum ignition pressure of 200 bar, * fourth-generation common-rail technology with a rail pressure increased by 400 bar to 2000 bar, as well as a new piezo-injector concept with direct nozzle needle control for greater flexibility in injection timing, leading to smoother running of the engine, * larger, variable oil spray nozzles and variable water pump, * dual-stage supercharging. Another design innovation is the camshaft drive positioned at the rear. This way, with a north-south installation design and engine bonnet rising towards the rear, it is possible to comply even better with pedestrian protection regulations. A promising future for the new four-cylinder diesel engine For an engine of its displacement, it is exceptionally compact, so that it can be fitted in different installation spaces. Beginning in 2008, this new four-cylinder diesel engine will replace four of the existing diesel engines at Mercedes-Benz. It can be installed either lengthways or crossways in various model series, and several power rating variants will be available. Apart from the C-Class, the engine will also be installed in the E-Class, in the new GLK-Class and in the future E‑Class Coupé. With its impressive output figures, the new engine will replace higher-displacement engines in heavier vehicles, where it will be able to reduce consumption effectively through this "downsizing". Ingenious fine detail work reduces consumption In the Mercedes-Benz C 250 CDI BlueEFFICIENCY Prime Edition the new diesel engine is combined with a sporty six-speed manual transmission with overdrive. This, too, contributes to the great efficiency of the model. Furthermore, Mercedes-Benz engineers have drawn up an additional package of measures in order to achieve the most exceptional consumption figures. The package includes among other things: * aerodynamic finishing touches, with particularly airflow-enhancing exterior-mirror housings as well as smooth underbody cladding; * newly developed tyres that reduce rolling resistance by 10 percent; * an efficient energy-management system with adaptive power steering, which with the help of an additional valve, closes the flow of the power-steering pump when it is not required. Useful information: new gearshift and consumption display on dashboard Experience from Mercedes-Benz eco-training shows that the driver, too, can save fuel by adopting an energy-conscious style of driving - and also do that without compromising driving pleasure. In the C 250 CDI BlueEFFICIENCY Prime Edition a newly-developed gearshift display on the dashboard assists the driver by informing him of the best moment to shift gear in order to save fuel. In addition to this gearshift recommendation, the instrument cluster shows the precise current fuel consumption. Sporty genes, state-of-the-art engineering, extensive equipment and appointments The basis of the new C 250 CDIBlueEFFICIENCY Prime Edition is the C-Class Saloon of the AVANTGARDE equipment line, in which the sporting genes of the Mercedes-Benz brand come particularly to the fore, most noticeably in the radiator grille with its distinctive louvres and the large, centrally positioned Mercedes star. Among car connoisseurs this design element has been seen, for a long time, as a typical badge of the sportier Mercedes models. Now, in the AVANTGARDE models of the C-Class for the first time the star graces a saloon, as an unmistakable expression of the vehicle's inherent strengths: agility, power and performance, without at the same time neglecting other time-tested C-Class attributes such as safety and long-distance comfort. Aluminium interior trim (optional: bird’s-eye maple) and other stylish details accentuate the sporty, effortlessly superior appearance of this model. The C 250 CDI BlueEFFICIENCY Prime Edition is equipped with 16-inch light-alloy wheels and 205/55 R16 tyres as standard - in addition to this, 16-inch light-alloy wheels in sporty 7-spoke design (likewise 205/55 R16 tyres) and 17-inch light-alloy wheels in 5-twin-spoke design with wide-base tyres (225/45 R17 at front, 205/40 R17 at rear) are available as no-cost options. Naturally, all the pioneering technical systems of the C-Class are on board as well: for instance, the AGILITY CONTROL package with situation-responsive shock absorber control, the Intelligent Light System with five different lighting functions and the PRE-SAFE® anticipatory occupant protection system. The extensive standard equipment also includes the Audio 20 infotainment system. This features, among other things, a keypad to enter telephone numbers and radio frequencies, as well as a Bluetooth interface that connects the mobile phone wirelessly with the hands-free feature. Floormats with the lettering "Prime Edition" draw attention to the special status of the new model. Prime Edition limited to 5000 units The C 250 CDI BlueEFFICIENCY Prime Edition model can be delivered in obsidian black, palladium silver or iridium silver. It is also optionally available in the special paint finish diamond white metallic. The sporty appearance can be emphasised even more forcefully with the optional AMG sports package, which includes distinctively-styled front and rear aprons as well as side skirts. 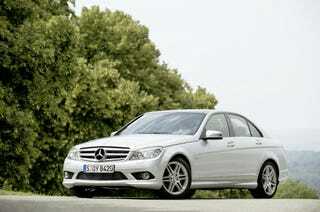 Production of the C 250 CDI BlueEFFICIENCY Prime Edition is limited to 5000 units. It is a consummate performer in terms of its sportiness, environmental protection and economic efficiency. Its price (including VAT) is 40,638.50 euros.